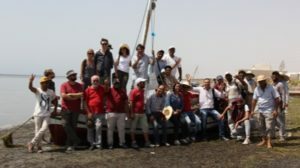 The training as core part of the Training in Action project took place in July 2017 at the site of Iunca. The aim was to start the basic training to select participants to form a number of expert archaeologists who, at the end of the project (2019) will be able to train other archaeologists on the following aspects of the Heritage protection: field survey techiques, GIS, magnetometry, pottery cataloguing, object recording, photogrammetry and 3D modelling, management of monuments and sites, outreach activities. The fieldwork at the site of Iunca developed over 4 weeks: weeks 1 and 4 (Durham University) were devoted to the training on survey techiques, GIS, magnetometry, pottery cataloguing, object recording. At the end of week 4 the next steps of the project were discussed with the selection of mini projects. Week 2 (UCL) focused on the use of photogrammetry for recording monuments and objects and the data processing to create 3D models. Week 3 (KCL) was devoted to the planning for protection and preservation of sites and monuments; the development of outreach activties to engage the general public and to increase awareness of the importance of the cultural heritage.